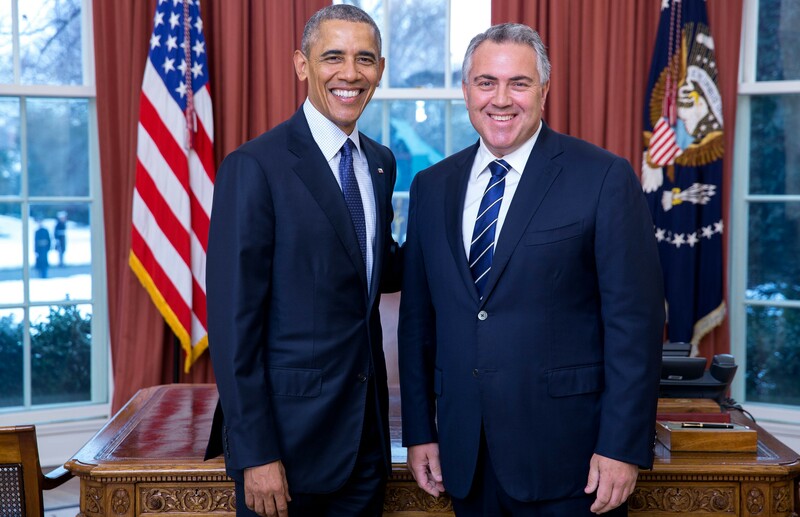 During a speech in Chicago last week, Australia’s Ambassador to the US, Joe Hockey, said it was the ‘history that’s been forged in shared pain that in many ways defines how loyal you are to each other’. Australia and America, he said, have a ‘partnership forged in blood’. Then, reports in the weekend press suggested that Hockey is looking to take this sentiment further by developing a TV ‘docudrama’ celebrating the ‘mateship’ between Australia and the US. This ethic, the series will show, arose primarily from the wars that the two countries have fought together over the last century, from John Monash’s command of US troops at Le Hamel in 1918 to joint operations in the Middle East in the wake of 9/11. In addition, the embassy in Washington is planning a series of associated commemorative events, including a ‘mateship’ gala ball. This is no ambassadorial whim. Indications are that Hockey’s ‘mateship’ master plan has the backing of the Department of Foreign Affairs and Trade, Defence, Veterans Affairs and the Australian War Memorial. The Prime Minister’s Office will apparently sign off on the project. To be fair, Hockey proposed the plan for this TV series before Trump’s inauguration. Clearly, too, it is not the only card in his diplomatic playbook. During his address to the Chicago Council on Global Affairs, for example, Hockey (speaking more candidly and with greater insight into the new America than either Foreign Minister Julie Bishop or Prime Minister Malcolm Turnbull have done) also warned of the consequences should isolationism and narrow nationalism take hold in the US. He appealed to the tradition of American global engagement. ‘Asia needs you’, he told his audience, conceding that while ‘America first’ might tap into deep-seated domestic grievances, it has the capacity to harm the country’s reputation abroad and its relationship with allies. Moreover, there is every reason to believe that the way to capture the new President’s attention is not through long counsel or the patiently composed brief (Trump is not enamoured of these traditional bureaucratic channels), but through the cinematic lens. The alliance is stronger for its shared history: few would contest this. But at a time of uncertainty, the past can be narcotic. Witness how the language of shared military sacrifice offered something of a rhetorical life raft for American Congressmen and Senators, many of whom appealed to this very narrative in the wake of the controversy that attended the leaking of the tumultuous Trump/Turnbull conversation. But will this ‘G’Day 100 years of mateship’ (the project’s draft title) actually work? The Trump White House is perhaps the most ahistorical in post-war US history. Notwithstanding the recent tours of reassurance through North Asia and Europe by Secretary of Defense James Mattis and Vice President Mike Pence respectively, the new administration has shown that appeals to sentiment and common values will cut little ice with a team looking primarily for allies to do more for themselves, and for Washington. The idea, put forward in some quarters in Australia, that the knowledge possessed by some US military commanders of Australia’s role in the Pacific War will translate into some kind of special treatment, is deeply problematic. It assumes that historical memory will loom largest in the most demanding and fluid strategic context both countries have faced since the end of the Second World War. The fundamental problem with the ‘mateship’ project, however, is that it represents once again the apparent triumph of stale thinking, and the lazy fusion of the Anzac legend with the US alliance. Such a strategy derives straight from the John Howard playbook, the former Prime Minister being the first Australian leader to divine an arc of Australia-US cooperation from the World War I to Baghdad in 2003. As I argued in my recent Lowy Institute Paper, Fighting with America, by casting the alliance in bronze and clothing it in khaki, Howard elevated it atop a new pedestal, and virtually above criticism. The attempt to highlight military cooperation across the last century also reinforces the belief in US policy circles that Australian support at a time of conflict is more or less assured. Is this really the kind of message policymakers and politicians should be transmitting to this administration? Is it really the best way of quietly engaging and influencing Trump and his team? Australia can do better than this. Now, surely, is not the time to be retreating into wilful sentimentality. Makers of the docudrama would do well to point out to American audiences the various times throughout the history of the alliance where the imagery of comrades in arms has gained little traction in the Oval Office. It didn’t work for Robert Menzies when he sought American military assistance in the event of a scrap with Indonesia during the confrontation episode in the early 1960s. Nor did it work for Bob Hawke when he appealed to this history in his efforts to soften the harmful effects on Australian farmers of the US Export Enhancement Program in the 1980s. And it certainly didn’t work for John Howard when he marshalled this story in a direct appeal to Bill Clinton for American Marines during the East Timor crisis of 1999. As Howard later remarked, Washington’s reluctance to provide boots on the ground represented a ‘poor repayment of past loyalties and support’. Hockey is not the first to summon forth ‘mateship’ in the service of Australian diplomacy. Paul Keating, during a major speech on the nation’s Asian vision in January 1996, argued that mateship could be equated to the Asian value of communitarianism. He was looking for yet another way to connect Australian culture to that of its regional neighbours. In 2003, John Howard included ‘mateship’ as the primary Australian value in an update to his government’s Foreign Policy White Paper. It should not be forgotten, too, that at previous moments of great strategic flux America itself has not hesitated to opt for self-interest over sentiment. Indeed, in the late 1960s US diplomats in Canberra cautioned their colleagues in the State Department against the assumption that the ritual recitation of old battles and common endeavour in two world wars, or even in South Vietnam, would necessarily clinch Canberra’s acquiescence to US policy objectives. ‘Rhetoric and sentimentality must give way to mutual accommodation’, they wrote, noting that the ‘Coral Sea generation’ in Australia was being replaced by one more ‘critical’ and ‘discerning’. Australia would be better served by adopting a more critical and discerning approach to its management of the US Alliance under Trump, one that stresses the need for greater self-reliance both within and sometimes without the alliance, rather than selling tickets to a matinee of ‘mateship’.